The largest rock climbing festival in Armenia to date kicked-off on May 23 in Noravank, an area known for its challenging jagged cliffs and precipices. Mkhitar Mkhitaryan, one of the founders of Up the Rocks, said the festival attracted thirty participants, seven local Armenians, and the others from various countries such as the Czech Republic, Norway, South Korea, China, and France. Vasken Koutoudjian was asked by the director of Petzl to start communicating with “Up the Rocks” this winter, and learn more about the climbing initiatives in Armenia. Vasken started climbing seriously as an adult. He travelled, climbed a lot, and was involved with several French Alpine clubs. Ten years ago, he became a professional rock climbing instructor, getting involved with the International Mountaineering and Climbing Federation. He had always wanted to visit Armenia, and after discovering the potential the country has for climbing, and the possible involvement of Petzl, he had even more reason to do so. Vasken thought the festival went very well and was enthusiastic about discovering this new landscape. 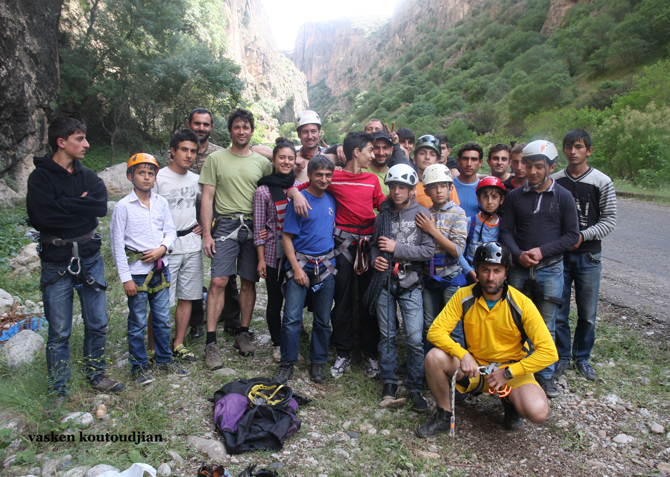 During the festival, Vasken trained six people as certified rock climbing instructors according to UIAA (The International Mountaineering and Climbing Federation) standards, thus helping to build the sport of climbing and grow its community in Armenia. Mkhitar said this festival was different from the first two because they invited children from the local villages of Areni and Arpeni to participate twice throughout the week. Around fifty children participated. 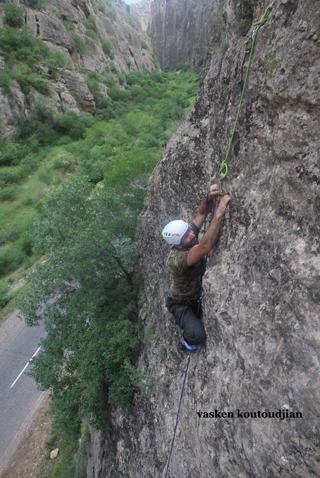 Luca Keushguerian, a member of Up the Rocks, as well as an organizer and participant of the Arev Armenian Rock Climbing Festival, echoed Vasken and Mkhitar’s sentiments. Luca noted that as a group, with a lot of help from the professional rock climbers who attended the festival, they must have doubled the amount of climbable routes and installed some for beginners as well.